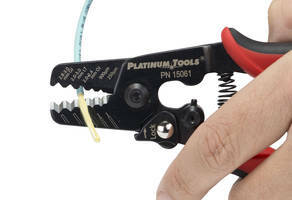 NEWBURY PARK, Calif., June 6, 2017 - Platinum Tools® (www.platinumtools.com), the leader in solutions for the preparation, installation, hand termination and testing of wire and cable, is proud to announce the launch of the 5-in-1 Fiber Optic Stripper and Fiber Optic Kevlar Scissors. The stripper (p/n15061C) and scissors (p/n10529C) will be featured during InfoComm 2017, held in Orlando, Fla. from June 14-16 at the Orange County Convention Center, booth #1961. With an affordable MSRP of only $21.95, additional 5-in-1 Fiber Optic Stripper features and specifications include a five cavity design which allows for use with a multitude of fiber optic cables, pre-set design ensures all cavities are precision set and no adjustments are required, cushioned grip handles provide positive non-slip, comfortable operation, and it is factory set and calibrated. It comes in a red/black body, it is 7 in. (177.8 mm) long, weighs just 4.59 oz. (130g), and strips 2.8 - 3.0 mm outside jacket, 2.0 - 3.0 mm loose tube fiber, 2.0 - 2.4 mm outside jacket, 900 micron buffer, 250 micron acrylate coating. The Kevlar Fiber Optic Scissors are also an affordable $18.95 MSRP, with additional features and specifications including ergonomic handles, easily cuts Kevlar®, full serrated bottom blade for non-slip cutting, and easily re-sharpens and holds cutting edge. Coming in red, it is only 5.75 in. (146.05 mm) long, weighs only 2.12 oz. (60g), and is best utilized for Kevlar material, Aramid yarn, soft cables, and electrical tape. “Our 5-in-1 Fiber Optic Stripper and Kevlar Scissors are a must for every professional installer’s bag,” Rothermel concluded. Pneumatic Scissors suit rubber cutting operations. Pneumatic Scissors reduce muscle fatigue.